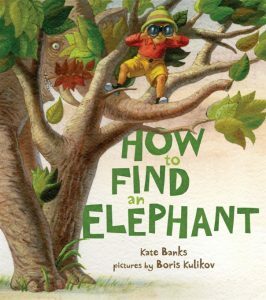 PreS-Gr 2 –An imaginative, elephant-loving young explorer goes on an adventure to find one in the wild. BANKS, Kate. How To Find an Elephant. illus. by Boris Kulikov. 32p. Farrar/Margaret Ferguson Bks. Nov. 2017. Tr $16.99. ISBN 9780374335083.